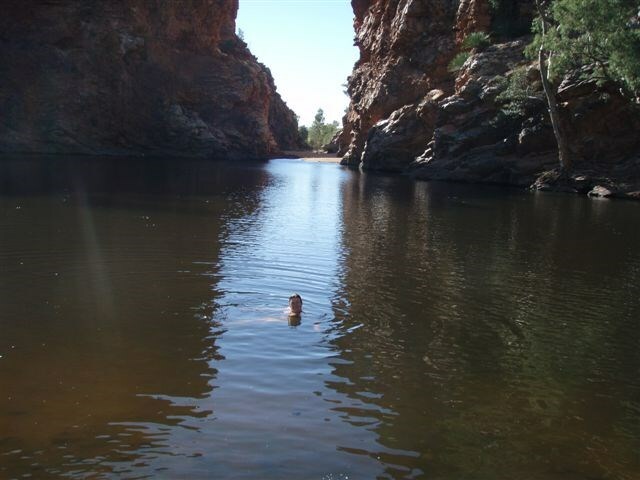 Ellery Creek Big Hole is a spectacular,permanent waterhole, that has cut through the Heavitree Range. 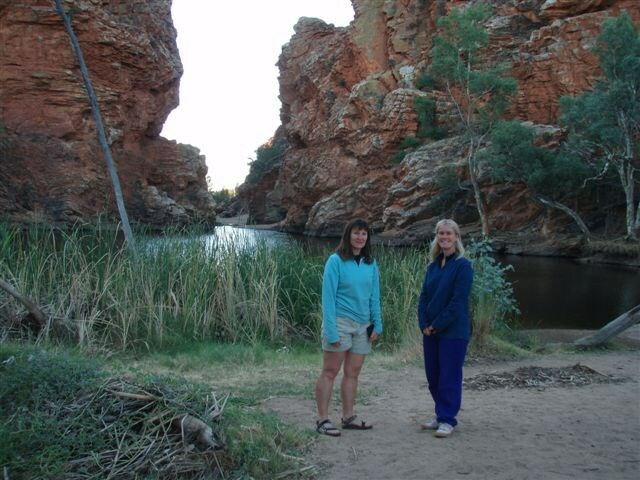 It lies at an elevation of 667m and is part of the West MacDonnell National Park, 90km west of Alice Springs. The waterhole is thought to be, up to 27 m deep. It is extremely cold because the lack of wind in the area does not allow the water to mix very much. The very bottom layers do not get much sunlight penetrating them to warm them up. The top layer is usually quite warm but it's a fairly shallow layer of warm water. As there are very few currents in the water, upwelling doesn’t occur, making the water extremely cold. Despite the cold and deep conditions, Ellery is home to an abundance of aquatic life, and its part of the Finke River system. About nine or 10 different species of fish occur in the Finke River system...the really common ones that people are most likely to be aware of are the spangled grunter, boney bream- which is quite a large silvery fish. Quite often in winter these fish are found dead around the edge of the waterhole. This has nothing to do with the water quality but the different temperatures of the water, which has an impact on the oxygenation of the water. BUT WHY DID IT FORM? Approximately 850 million years ago this area was inundated by a shallow sea. Quartz rich sediments were deposited first, and then other sediments were deposited on top of them until the sea retreated some 460 million years ago. Massive earth movements folded the rock layers and caused some layers to slide up and over one another, resulting in folds, cracks and other areas of weakness. This is now what is known as the Heavitree Range. Some of these layers now stand vertically along the sides of the big hole. As a result, the fractured rocks are more easily eroded by running water. Ellery Creek formed along this line of weakness and over the past 315million years the softer layers of rock above the quartzite were worn away and removed by erosion. This creek eventually gouged out the weaker rocks creating a gap through the ranges. This gap is now known as Ellery Gap. When the creek is in flood, water rapidly flows through Ellery Gap. The turbulent rushing water is loaded with rock fragments and acts like liquid sandpaper, scouring away the walls and creek bed. The fact that the big hole is so deep indicates that the creek bed contains softer layers of rocks than the sides of the gap. Therefore, erosion is occurring at a faster rate vertically than it is horizontally. To Log this cache go to the listed co-ordinates and email me the answers to these questions. 1.How many years ago did the Heavitree Range form? 2.How high was this range originally? 3.How did the Heavitree quartzite form and what is it made up of? 4. Besides quartzite, name two other types of rocks found in this area. Face the gap, opposite you and look at the folds in the rock. Is this an anticline (concave down) or a syncline (concave up)? This cache was placed on Day 9 of our Larapinta trail walk.